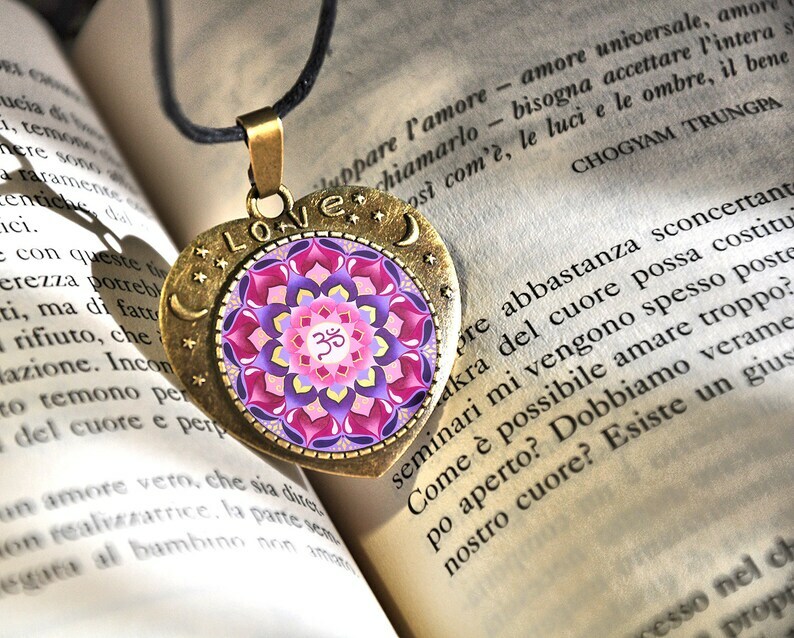 The mandala of the pendant symbolizes the Sahasrara chakra, that is located on top of the head. It's the chakra of spiritual power, of universal knowledge and of the communion with the cosmos. The higher states of consciousness reachable by human being rotate around this chakra. Main colors: pink, purple, gold, white. Mandala necklace, good luck jewelry, om symbol, sound of creation of the Universe, girlfriend birthday gift, valentine day present, wife. Buddhist mandala, purification, heart shaped pendant, with moon and stars, love lettering, gift idea for valentines day, for daughter, aunt. Mandala necklace, buddha eyes, zen meditation, representation of universe, spiritual regeneration, wellness jewelry, bloomsday, women, mom.